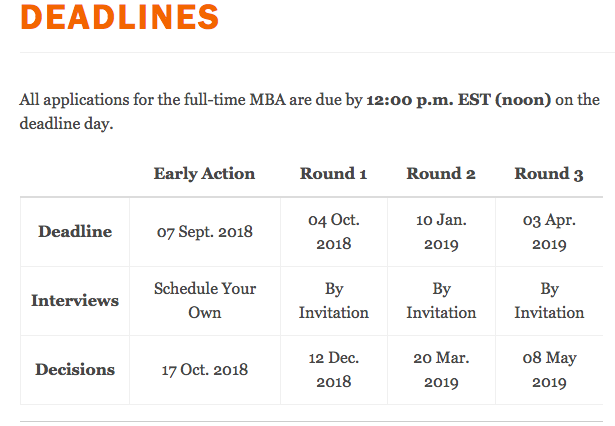 The early action deadline is Sept. 7th, with admissions decisions due on Oct. 17th–just a few days after the school’s regular round one deadline of Oct. 4. Applying in the early round allows candidates to schedule their interview without waiting to be invited. Darden will host open interviews for early action candidates between mid-July through to the of September. The online application for 2018-2019 went live today. This year, Darden also changed its essay approach, ending one long essay for five shorter questions so students can talk about multiple dimensions of their background with a greater emphasis on leadership and impact. (a) The Batten Scholars Program: Sponsored by Darden’s Batten Institute for Entrepreneurship and Innovation, this competitive program supports full- and partial-tuition scholarships for top students with interest and experience in entrepreneurship, innovation and technology. (b) New Batten Foundation Darden Worldwide Scholarships: Beginning in the 2018–19 academic year, the scholarship program will fund the course fees for all full-time students who participate in a Darden Worldwide Course. (c) Madison and Monroe Scholarships: These prestigious scholarships will be awarded each year to top candidates. (d) Darden Jefferson Fellowships Competition: Top candidates from around the globe will now have the opportunity to compete for a nomination for the prestigious Darden Jefferson Fellowship, directed by the Jefferson Scholars Foundation. International candidates interested in the fellowship must apply in Darden’s Early Action round. Applications will be reviewed by the Darden Admissions Committee and considered for nomination to the Jefferson Scholars Foundation. U.S.-based candidates interested in the fellowship should apply Early Action or in Round 1. Last year’s entering class at Darden lived up to the school’s usual high standards. - Last year’s incoming was 326 students, down from the 345 students who arrived in Charlottesville in 2016…but still larger than the 316 students who enrolled in the program four years ago. - Overall, Darden accepted 24.5% of applicants, putting it in the same company as Chicago Booth, the London Business School, and Michigan Ross. - The average GMAT was 713, one point higher than the 2018 Class and a seven-point improvement over the last graduating class. - International students had an average score of 715. - For the fourth straight year, undergraduate GPAs remained at 3.5, with the lowest reported average being 2.1 and the highest at 4.0.